Many of you may already know about my ministry, First Night of Freedom. It’s a ministry that began in August of 2011 and it serves two purposes - to raise awareness of the reality of human trafficking and to raise supplies for rescue shelters for victims. I have been wary of writing too much about this subject here on God’s Daughter because I felt that it was too strong of a topic (and can be very graphic) for a personal blog. But I was praying about it the other day and I sensed God telling me that if I can, I should. If I have the resources to raise more awareness through my 800+ follower blog, I should use what I have at my fingertips to tell more people about this cold, hard reality. So I guess this is sort of an introductory/warning post that I will be writing more on this subject. It’s a big step because it’s such a difference from the encouraging, uplifting, spiritual posts I usually write about. But fighting against human injustice is part of who I am, as well as being a daughter of the King. This is a passion of mine, if you would like to call it that. And God’s Daughter is made up of who Raquel IS because of God’s work IN her. Today is an awareness day. All across the globe, people are coming together to be the voice for the 27 million victims of human trafficking. 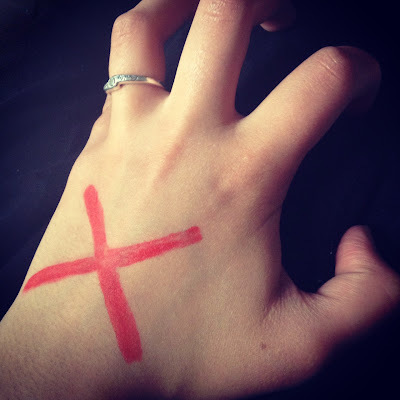 We are raising awareness and taking a public stand against this injustice by drawing a red X on our hand. Would you join us? Learning facts and statistics about human trafficking isn’t an overnight thing. I’ve been involved in fighting against it for almost two years now and still don’t know half of what I should. If you would like to learn more about my story and how I started my ministry, feel free to click the First Night of Freedom button that you’ll find at the end of this post. If you would like to learn more about human trafficking and how you can get involved to fight it, here are some websites that provide quick, easy facts and information to read over. But I will leave you with a few important basics that every person should know. You would be surprised at how many of these facts are unknown. Winner of the Lilla Rose hair clip is Hearthkeeper In Christ. Please contact me with your shipping information within the next 24hours or a new winner will be chosen. Human trafficking is such a big issue and such a terrible, terrible crime. Thank you for raising awareness and supporting against it (if that made sense). I'm going to go put on my read X now!!!!! Thank you for writing about this, Raquel. Not everything makes people comfortable but things that are wrong like this, and actually go on, need to be spoken of. Thank you! Longtime lurker here, hi ;) Slavery is SUCH an important issue and it's so cool to see you using your blog as a platform to take action, even when it's not pretty. You're right, it IS disturbing, we SHOULD be disturbed. If anyone here is interested in learning more, I highly recommend Kevin Bales' book Disposable People...it's heartbreaking and fascinating. Thank you so much for raising awareness and for giving! Can't wait to see your future posts on the subject. Thanks for posting this. This is a cause that is dear to my heart, it is part of the reason that I am majoring in crimnal justice and social work as a college student. Also thank you for raising awareness. Human trafficking is such a terrible injustice, but it is good to know that efforts are being made to fight back! A couple weeks ago my university had a human trafficking awareness week which was very successful! Wow ... that is so, so sad. Your ministry is in my prayers, along with all of those poor souls out there in need of Jesus' love and healing.